Well, what a good day out of motorsport that was ! The event marked the debut of Adam Quinn as an FDMC Clerk of the Course, and what a good set of tests were laid out. 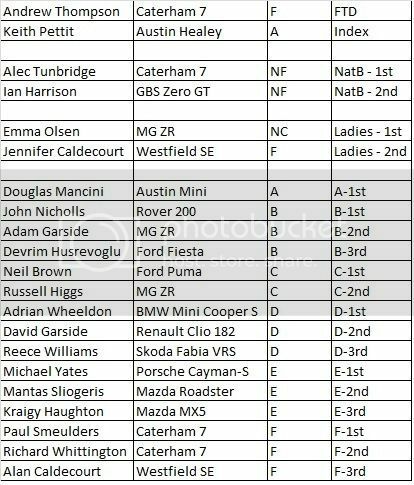 We had a full entry to the Clubmans event, and were additionally pleased to welcome some BTRDA championship contenders to the National B permit event. For the first two morning courses we were able to add the new loop in each direction, which added length but also some driver caution, and therefore time, to the overall runs. The feedback I got suggested the loop was a bit Marmite... some competitors loved it, some found it a bit difficult to navigate. Fair play to those who were able to attack the course & eek out what proved to be some significant time advantages over their fellows. Some tough choices had to be made during lunch and the organisers reluctantly had to acknowledge that keeping the extended loop would mean seriously overunning on end-time. So the afternoon resumed, with courses 3 and 4 being the same layout back to back, and without the loop. Instantly, the competitor fun-factor was back, and significantly faster times were being posted by all. The event finished strongly at around 4.30, and awards presented after the site tidy-up. Overall, a sunny day, relatively stoppage free, and Doug Mancini's lovely Austin Mini Cooper-S the only retirement (& fuel filler cap since retrieved off the course). This is a direct link to the photos that Martyn Phillis took. Great day, cheers to all involved! Was nice to be back in the 'solo game' again! Equally gutted I missed out on 1st in D by 0.5 secs, especially after thinking the day was lost after 2 wrong test on Course 1! Annoyingly I can't make the summer one so will have to try to get to one later in year.